Looking at the fat, sugar and calories in chocolate, it would seem that the best reason for indulging is pleasure. Yet the cocoa solids in hot cocoa and hot chocolate do more than soothe our mind. New research is serving healthy reasons to bite down on our favorite bar. LOOKING FOR a good reason for a bad habit? The answer is antioxidants. Chocolate, especially dark chocolate and cocoa, has plenty. These protect cells by killing free radicals that would otherwise attack them. This reduces our risk of degenerative diseases and cancer. There are more than 6,000 types of antioxidants. The most commonly known are vitamins A, C, and E. Antioxidants are divided into different groups. Those in chocolate are classified as flavanols. Studies have shown that people with high blood levels of flavanols have lower risk of heart disease, lung cancer, prostate cancer, asthma, and type 2 diabetes. Yet there are many flavanol-containing foods that are healthier overall than chocolate. Green tea and dark skinned fruits and vegetables are the best example. However, while these are admirable food choice they don’t have as many flavanols as our tasty brown friend. According to a study published in the December 3, 2003 issue of the Journal of Food and Agricultural Chemistry, cocoa has more flavanols than black tea, green tea and red wine. The large amounts of these antioxidants are due to cocoa’s purity. Pure cocoa powder has twice the amount of flavanols as dark chocolate, and milk chocolate has half the amount of dark chocolate. Still, before you stock up on Orion and Nestlé, think snacks and not stacks. Chocolate does have health benefits but we need to weigh these in with its detriments. 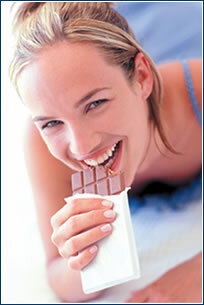 Chocolate bars are high in sugar, saturated fat and contain oxalic acid. All chocolate, even high quality bars and those purchased at health food stores contain these three no-nos. But thankfully all fat is not created equal. One-third of chocolate’s saturated fat content comes from stearic acid. Stearic acid is beneficial because it converts to heart-healthy oleic acid. And since it contains no milk, the fat in dark chocolate contains no cholesterol. What about the oxalic acid? This is only a problem in theory. Though this acid can deplete us of calcium and contribute to kidney stones, it only becomes an issue if we indulge in excess. And while there’s no arguing that chocolate has caffeine, its amount melts in comparison to our favorite dark brew. Where a cup of coffee averages 100 mg, the typical chocolate bar has only 10 mg. If we take chocolate in moderation it won’t be a contributor to any illness. Instead it will provide only benefits. These don’t end with its ability to protect cells. Two studies published in The Lancet suggest that cocoa flavanols decrease LDL cholesterol. This is the bad form of cholesterol that can clog arteries. Eating chocolate may act as a cough suppressant. In 2002, researchers with the National Heart and Lung Institute at Imperial College (University of London) artificially provoked a cough in ten healthy nonsmokers. They discovered that the chocolate chemical theobromine prevented coughing more effectively than traditional cough medicine. Enjoying a box of Valentine’s chocolates may even help your heart. Research in the laboratory has shown that a group of cocoa antioxidants called polyphenols appear to relax the blood vessels, thus allowing blood to flow more efficiently and reducing the strain on our heart. How does one evaluate a successful career?